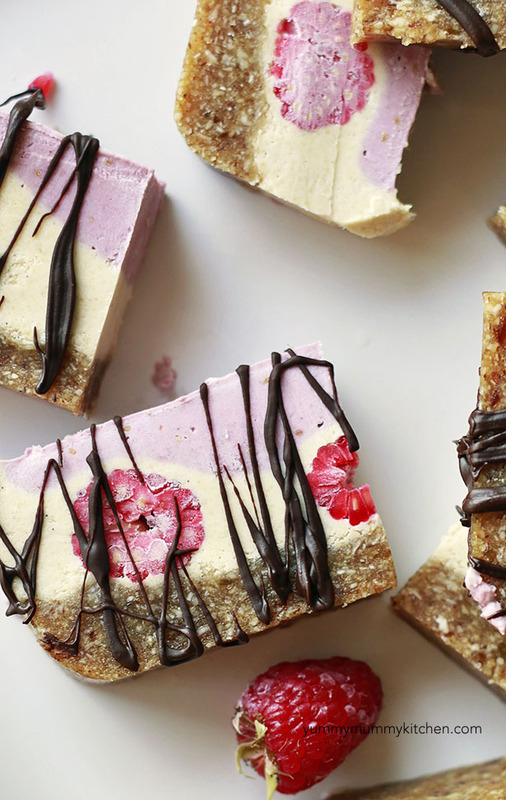 A delicious raw, vegan, paleo cheesecake made with natural ingredients like dates and cashews. With Valentine’s Day just a couple of weeks away I thought it time to make you a sweet pinkalicious treat. But I love you too much to give you refined sugar and processed ingredients. And they are just not necessary. It’s beautiful organic food like this that reminds me how amazing nature is. I mean, this raspberry vegan cheesecake dessert is 100% plants! Cashews are a common ingredient in vegan and raw creamy recipes. Once soaked, they can be pureed into a smooth “cream” that can be flavored however you like. If you’ve never tried a cashew based cheesecake it may sound a little suspicious, but I promise it’s just as tasty as the real thing. Yummy Hubby had no idea this was a healthy dessert. When I asked him what he thought this was made out of he was sure it was cream and sugar. Nope, it’s just pure fiber, protein, plant-y goodness. Raw vegan cheesecake is one of my favorite treats to make and my whole family loves it. Let’s talk about the vegan cheesecake crust. Butter, flour, sugar? Nope… try dates, coconut, and nuts. I used the nuts I happened to have around: almonds and macadamia nuts, but you could really use your favorite nuts. In the pictures here I’ve blended the crust a bit too much. I actually like larger chunks of nuts to add texture and crunch. 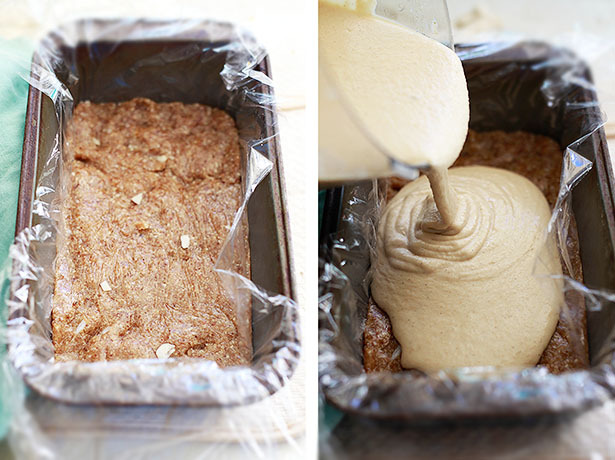 Press that sweet base into the bottom of a loaf pan lined with plastic wrap or parchment paper. Whip together the cashews and filling ingredients in the same food processor or blender until smooth and creamy and pour about 1/3 over the crust – just eyeball it. Add the raspberries (you could use any berry!) to the remaining batter and pour it over for another layer. Isn’t she pretty?! I pressed some whole raspberries into the vanilla layer and we all agreed that was one of our favorite parts. 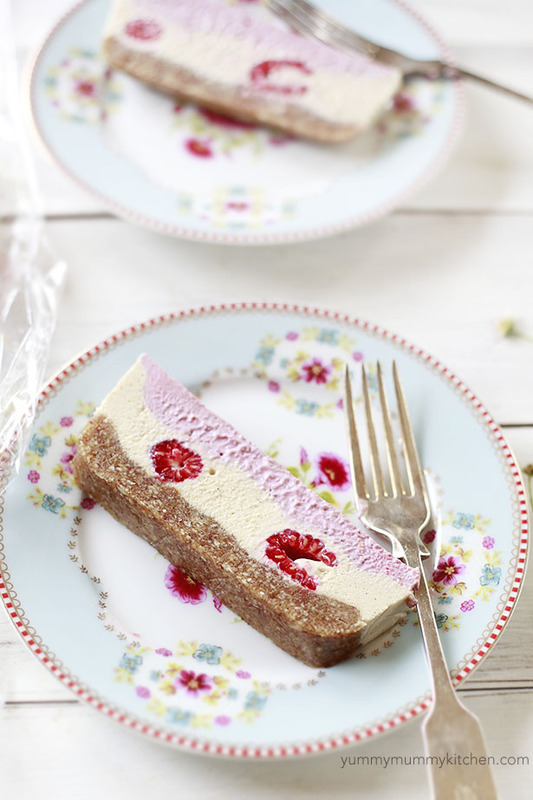 This dreamy dessert can be served chilled like a cheesecake, but we like it best very frozen, like an ice cream cake. Having these little squares in the freezer for after school snacks is just wonderful. Okay, who am I kidding, I totally eat several for breakfast as I dash out the door. You can make these even more festive for Valentine’s Day by drizzling a a little dark chocolate over the top. Divine and guilt-free! Have you made cashew based creamy recipes before? If you like vegan cheesecakes, you’ve also got to check out my Vegan Key Lime Pie and Vegan Peanut Butter Cup Cheesecakes! 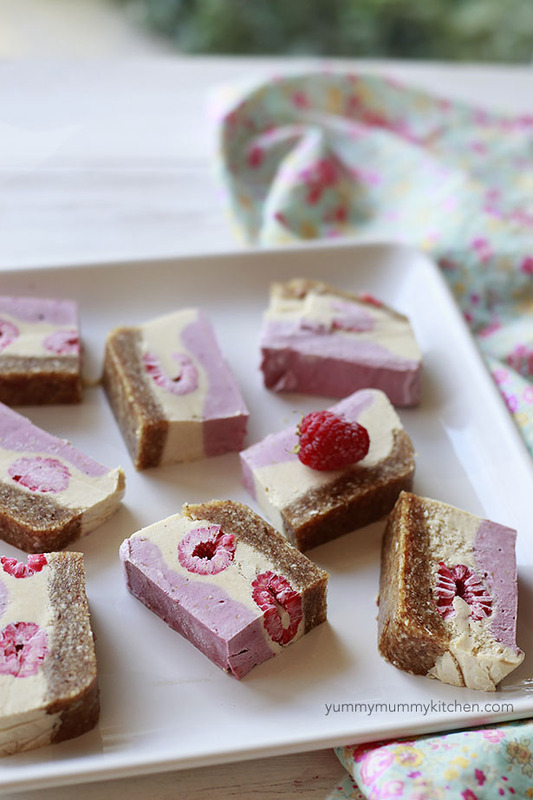 Creamy dreamy raw cashew based cheesecake filled with raspberries is such a beautiful and delicious treat! Line a loaf pan with plastic wrap or parchment paper. Set aside. 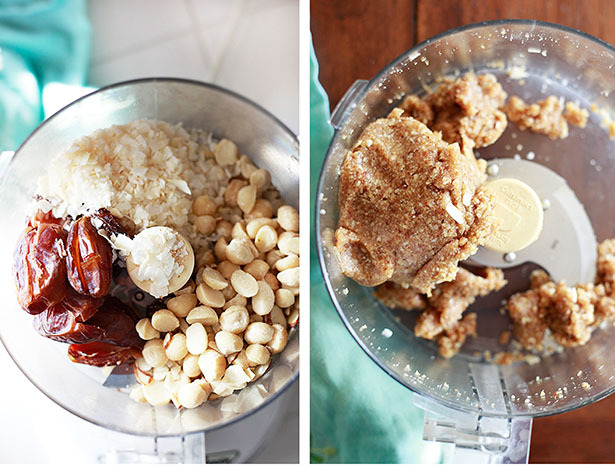 In the bowl of a food processor or heavy duty blender, pulse dates, nuts, and coconut until the mixture comes together into a ball of dough, but still has some visible pieces of nuts for some crunch. If the mixture is too dry, add another date or a few drops of water. Press this crust into the bottom of the prepared loaf pan. Place the drained cashews, coconut oil, syrup, lemon juice and coconut milk into the food processor or blender and puree until very smooth and creamy. Stir in the vanilla bean seeds. Pour roughly 2/3 of the cashew "cream" over the crust. Press 1/3 of the berries into the vanilla cream. Place pan into the freezer. Add the remaining 2/3 berries to the food processor with the remaining 1/3 vanilla cream. Puree until smooth. 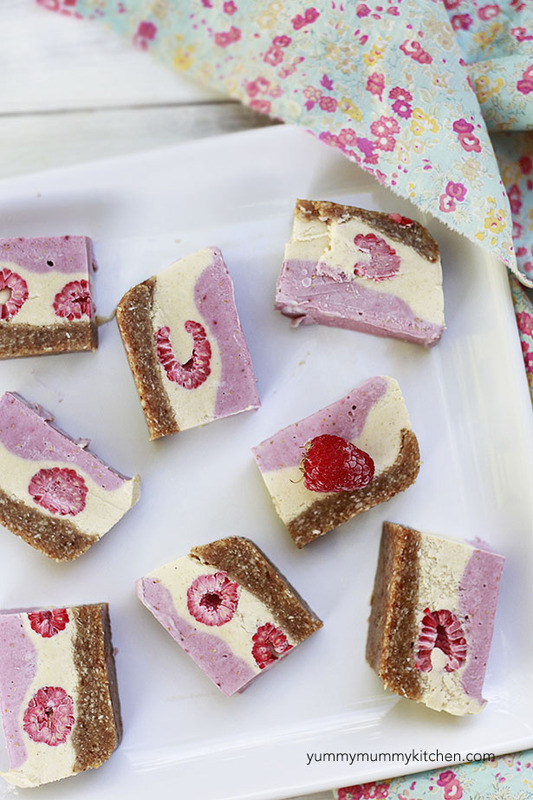 Pour the raspberry cream over the vanilla layer and place back in the freezer for several hours, until completely frozen. Our family likes this best served frozen and my kids consider this "ice cream" but others prefer it just chilled like a cheesecake. My husband I began eating a plant-based diet a little over a year ago. As anyone who is vegan knows, it is not easy to find “treats” in this lifestyle. When I saw this recipe, I was very excited. It looked delicious in the photo and cheesecake is one of my husband's favorites. But I was disappointed. It doesn't taste sweet like a desert – it doesn't taste like cheesecake. It is just a weird, kind of creamy nutty tasting thing. He ate a piece and tried to be nice but I did not eat the piece I took for myself and I won't be making this again. Good to know. Thank you for posting.